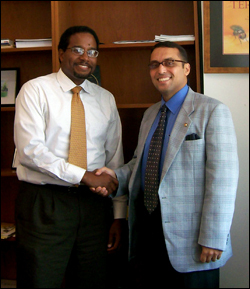 Clark School Dean Darryll Pines (L) and Dr. Ahmed Sultan of Alexandria University. Dr. Ahmed Sultan of Alexandria University in Egypt is visiting ISR and meeting with faculty in the A. James Clark School of Engineering. Dr. Sultan, who helped initiate a memorandum of understanding between the two universities in January 2009, is an expert in the field of cancer research. He is here to facilitate collaborations between faculty of the two universities in a broad variety of areas including stem cell research and nanotechnology in medicine. Dr. Sultan received the American Association of Cancer Research's Avon International Award in December 2008 for "Alternative Suppression Strategy for Human Breast Cancer Invasion and Metastasis: A Potential for a New Differentiation Therapy." He is an associate professor in the Clinical Biochemistry Department in the Faculty of Science.